I tagged the match between Belinda Bencic and Yulia Putintseva as one to watch for the drama in yesterday’s post and oh MY did it deliver! In what was the match of the day, Bencic beat Putintseva, 7-5 4-6 6-2 in an absolute rollercoaster of a contest 🎢. This match had so much drama and wackiness and bizarreness (is that even a word?). From Putintseva checking the tension of her racquet after suddenly losing a game in the second game, to Mo Lahyani asking people to stop smoking in the stands, to Putintseva’s reactions as she walked off court. It was a good match on all levels. It is a difficult one to review as there were so many swings in momentum and no obvious patterns of play. Putintseva failed to serve out the opener at *5-4, completing losing the plot at the end of the set. Putintseva then let slip a 4-0 second set lead before steadying impressively to win the last two games and force a decider. Putintseva was also a break up in the decider before Bencic reeled off six straight games. There were some really close games in the third set and the one at 3-2 was the clincher as Bencic broke in a five deuce game. I thought Bencic was hitting cleaner at the end and more aggressively. Both had their emotional outbursts during the match. It felt like Bencic focused better at the end with Putintseva getting distracted and frustrated about things around her such as the pro-Bencic crowd, which she did complain about at one point. Putintseva ended the match by dishing out drive-by handshakes to both Bencic and Lahyani, wagging her finger to the crowd and then putting up her middle finger to them as she walked off. Poots is an absolute hoot 😂😂😂 . A great win for Bencic who has now come through two three set matches and plays Petra Kvitova in the third round. I think BB will be relishing going up against Petra as the underdog and surely with some confidence from these wins and having plenty of matches in Oz. I was surprised by this result as Bertens had looked in good form down under and played very well against Alison Riske in the first round. Bertens is the highest ranked player to fall so far. For Pavs, we all know what she is truly capable of and this was her 29th career top ten win (via Tennis Abstract). I think she’s most dangerous as an underdog as she proved today. It’s a big win for Pavs as she moves into the 3rd round of a Slam for the first time since the 2017 Australian Open. Not surprised to see Sasnovich win this match which was her ninth win already of 2019! The Belarusian is looking in superb form this year. I fancied Anisimova’s chances in this match but omg that scoreline 👀. Regular readers will know i’m high on AA so I won’t go on anymore! As shocks go, I think this is the biggest one of the women’s tournament so far. The world number 240, Birrell beat the in-form, Vekic, 6-4 4-6 6-1 victory. It was the manner of the win that impressed me as Birrell played a sensational third set. The Aussie was absolutely relentless hitting side-to-side and dictating against Vekic, who is an aggressive player. Vekic lost her way towards the end of the second set when she was aggrieved at not being able to challenge. She never really recovered her form after that and was simply outplayed by Birrell in the decider. What a shot from Petra! A great shot of Maria Sakkari by Jimmie48 celebrating her second round win over Astra Sharma. I like Sasnovich’s humour! Keep listening to when she talks about how she will prepare for her next match. Mert’s analysis is already on point and I learn so much. Click on the link below for his take on Petra Martic’s straight sets win over Marketa Vondrousova. There are so many good matches on Thursday’s schedule. I’m most excited for Muguruza vs. Konta which gets the MCA night session. For Thursday, i’m not feeling that decisive! The only upset I would really go for is Yastremska over Suárez Navarro. I’m shocked to see Yastremska is actually the favourite with the bookmakers which instantly makes me wary! I’m interested to see how the teens get on against seeds. I will be very surprised if Andreescu can beat Sevastova as the Canadian player looked like she was struggling physically in her first round. Swiatek vs. Giorgi intrigues me. I think Halep has another tough match on her hands against Sofia Kenin, but it is one I feel like she will scrap through again. I’m high on Kuzmova and she’s due a big win. Not convinced it will happen against Svitolina? The only other seeded players i’d tag with a minor upset alert would be Wang Qiang against Krunic and Mertens against Gasparyan. I read somewhere that Wang Qiang wasn’t feeling her game at the start of the season and Gasparyan, if fit and healthy, is a very dangerous player. 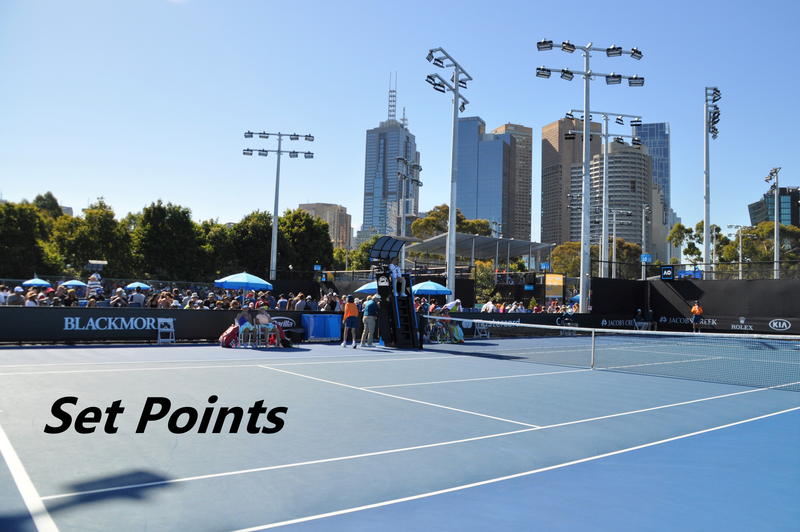 January 16, 2019 in Australian Open, Set Points, WTA. Aw I really dig Sasnovich. Such a sweet lady with such a great sense of humour. I hope she beats Pavs, although you just never know with Stasia. I’m really hoping I wake up tomorrow and see wins for Svitolina and Pliskova. I’ll be watching Serena while I’m at the gym before my seminar! Yes me too, I like Sasnovich. Aww I miss the student life. I’m hoping for some good matches this weekend! I was at the Bencic match, it was epic, plenty of drama, racket throwing and oddball moments. I raced outside after the match as I wanted to see Puts and she was going absolutely ballistic at her coach. After the second set I was sure Puts was going to win, but Belinda lifted her game and was playing great. Very happy to see Belinda take it out. That was an entertaining match, must have been great to watch live! Thanks for the onsite report. It’s always the coach or racket that is at fault. So far women’s top seeds doing better than the men’s. Ha! … Simona almost broke that calm you spoke of @James, but she came back. I understand those who don’t like her game or her person that much but, deep down, at least, you should be able to appreciate her fight sometimes. With her win, all top 8 seeds, I believe, are still in play. I’d say it is a solid tournament thus far. Ha indeed! This sense of calm is very unsettling. I’m quite liking it though for a change. This line-up of matches to come is exciting. It looks like the upsets will have to start coming in thick and fast now. The match ups are looking great from this point on. You really have to bring your A-game now. I didn’t know Ash was playing doubles with Vika. Not sure but fatigue could be a factor ?? Today was just odd haha! Great line-up of 3rd round matches. I’m excited to see how it will all unfold. Super excited for the next matches!! Great match apparently between Jo Konta and Garbi Muguruza, which only finished at 3:15 a.m.; there was hardly anyone around to watch its closing stages, as you would probably expect. Jo questioned the wisdom of their playing at that hour, but she put in a fine performance anyway. Footnote; the announcer on the 6 o’clock news on Radio 4 called Garbine Gabriela; was he thinking of Gabriela Sabatini? Great match indeed. The Eurosport Player, while still a bit clunky in places, is allowing me to catch up so enjoyed watching that one back. Konta’s got a point, I think it’s ludicrous to be playing so late/early. That’s unfortunate about the news on Radio 4 getting Muguruza’s name wrong!